As GNU / Linux user I use screen window manager to manage multiple SSH connections (all over one ssh connection) to a host over the last maybe 10 years. Though screen is generally popular it is still possible some novice sysadmin did not use it or (hope not) never heard of it. 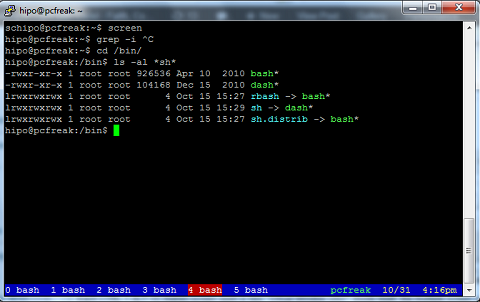 For those who don't use GNU screen still, give it a try; launch it within a (system bash, csh etc.) shell and then inside the main screen window launch multiple screen internal sessions (by pressing simultaneously) keys CTRL + ALT + c .
Each CTRL + ALT + c makes screen open a new "Virtual Window (pty)" inside itself, the multiple screen sub-instances are kept in memory of main screen program loaded in memory. In a way Virtual Windows of screen in logic are very Similar to Apache's Webserver Apache Parent and Child processes. Afterwards, you can open multiple Virtual Screens as I've mentioned with pressing CTRL + ALT + c.
Screen supports detaching multiple sessions (whether 2 or more screen sessions run with identical user credentials). 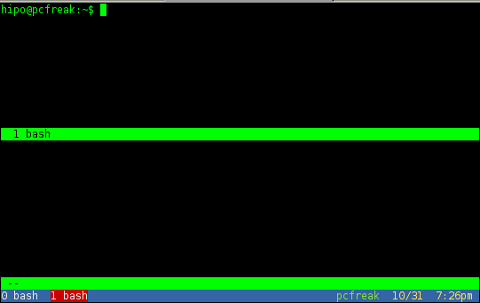 The -r switch stands for re-attach and second part of PID name like in above example pts-11.pcfreak pts-0.pcfreak is just indicating the hostname where screen was detached as well as the pty (pseudo tty number assigned to detached session), the time included shows the exact time in which main screen session was started for instance for screen 1549 it is 10/27/2012 09:45:58 PM. Many people who still remember irc clients like BitchX and epic and the IRC times should remember, how well known and frequent people used to detach those progs or even detach eggdrops with specific TCL scripts inside separate screen sessions. The most useful use of screen of course is to open multiple SSH sessions to different server nodes and keep permanently logged in on hosts by detaching the screen session. From security point of view it is a weak practice to keep logged in to multiple servers via SSH from one single screen session. If someone sniffs user password with which screen is started and attach to the screen session he will suddenly be granted to access to 10 more servers! etc. etc. , keeping screen detached with multiple sshs might save you a lot of time; this is especially if you have to login 10 times to the servers a day changing location – lets say if you use (notebook and travel a lot). Another good screenrc configured to make your screen sessions more user friendly is here. Sometimes, when a screen session is interrupted, because screen running host is restarted or shutdown, dead screen sockets remain. Of course set the desirable location for your .htpasswd in the AuthUserFile. Just in case if you decide to keep the same location as in my example you will further need to create the /etc/apache2/.htpasswd file. Note here that in the above exapmle the AllowOverride All could also be substituted for AllowOverride AuthConfig , you might need to put this one if you don’t want that all .htaccess directives are recognized by Apache. In the passwords prompts just type in your password of choice. Now we’re almost ready to have the website apache authentication working, only thing left is to reastart Apache. In other Linux distributions exec the respective script for Apache restart. Now access your website and the password protection dialog asking for your credentials to login should popup. which concludes to a nice PuTTy wrapper program called Putty Connection Manager . each one opening in a nice multi tab windows, like the good old linux gnome-terminal. Yesterday Iâ€™ve been to my cousin to whom I have installed Ubuntu 9.04 a week ago. She was not happy that by default Ubuntu doesnâ€™t handle the .torrent file extension by default. After 20 minutes of googling I finally found the solution.